Inhale, then exhale. This simple act could now save lives. A technology developed in part at EPFL can quickly identify the presence of a head and neck cancer, such as of the throat or mouth by analyzing people’s breath. The new device, equipped with extremely sensitive sensors, has been tested on patients and operates with a computer or even a mobile phone. It’s an innovative tool for the early diagnosis of tumors. Very few routine exams exist to detect cancer. Yet this disease is the third leading cause of death worldwide. Most tumors are found relatively late, which makes recovery less likely. The researchers managed to detect these nuances with the aid of a network of micro-sensors. The technology called MSS was initially developed jointly by EPFL researcher and the late 1986 co-laureate of the Nobel price of physics, Heinrich Rohrer. 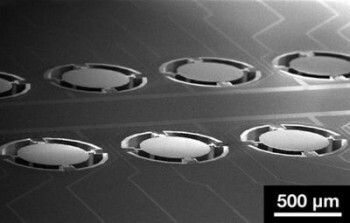 Each sensor is composed of a silicon disk 500 micrometers in diameter that is covered by a polymer and suspended by four minuscule “bridges” with integrated piezoresistors. When exposed to a gas, the polymer absorbs certain molecules and the disk changes shape. This deformation is detected by the four piezoresistive bridges, which emit an electrical signal. This phenomenon makes it possible to determine the signature of the gas and its concentration. The trick lies in using different polymers on each sensor, in order to obtain an overview of the gas composition. “There are already methods for detecting molecules called ‘electronic noses’ on the market. But they have a hard time analyzing very complex gases like human breath,” says Nico de Rooij. “Humidity in particular can disrupt the reading, leading to false positives or false negatives.” With the new sensors, the detection process becomes extremely accurate. But the story doesn’t end there for the sensors, which have numerous applications. Recently, the NIMS/MANA research center in Japan, another partner in the project, connected the sensors to mobile phones. This innovation earned them an award at the Nanotech 2015 event. This technology is also of interest to biologists. At the University of Neuchâtel, tests are currently being run by the Laboratoire pour la recherche fondamentale et appliquée en écologie chimique in order to analyze the gases given off by plants when they are attacked by certain insects or mushrooms. These gases serve to attract other insects that will protect the plant. The ability to detect this phenomenon early on could allow farmers to react more quickly to an attack and, as a result, use less insecticide.